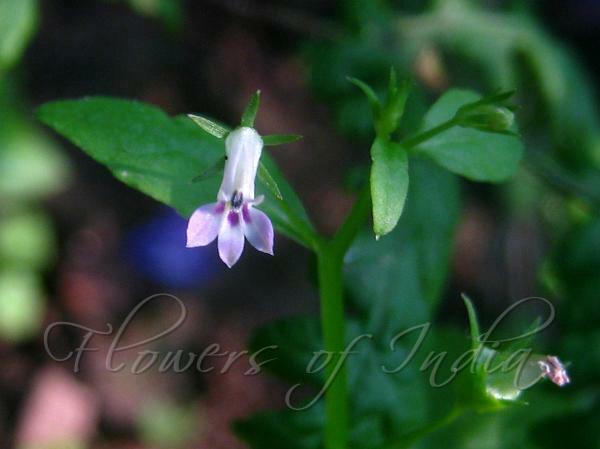 Heyne's Lobelia is an annual herb, 10-60 cm tall. Stems are erect, 3-angular, winged, hairless, branched. Leaves are alternate, leaf-stalks	1-4 mm, winged; blade broadly triangular-ovate, 0.8-2.5 x 0.4-2.5 cm, upper ones smaller and more narrow, hairless below, sparsely hairy above, base falt or shallowly heart-shaped, often decurrent, tip rounded or pointed. Flowers are solitary, axillary at leaflike bracts, often forming a raceme. Bracts are narrowly elliptic, shorter than flower-stalks. Flower-stalks are 1-1.5 cm, slender, with 2 bracteoles at base; bracteoles subulate, less than 1 mm, often caducous. Hypanthium is bell-shaped, 1-2 mm, glabrous. Sepals are longer than hypanthium at anthesis, but shorter than tube after anthesis, subulate, 2-3 mm, entire. Flowers are pale purple, 3-5 mm, inside sparsely puberulent; limb 2-lipped, upper lobes erect, linear, less than 1 mm; lower lobes spreading, elliptic to somewhat round, about. 2 mm. Stamens are fused	into tube above middle of filaments; anther tube is about 1 mm, lower 2 anthers barbate at top. Capsules are oblong or obovoid-oblong, 4-5 × 2-4 mm. Seeds are pale red-brown, ellipsoid, slightly compressed, smooth. 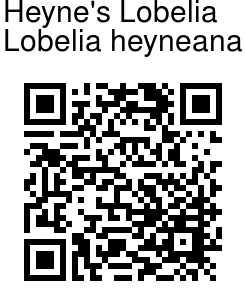 Heyne's Lobelia is found in Africa, Himalaya, India, Ceylon, Thailand, Indo-China, W. China, Malaysia, at altitudes of 1200-2500 m. Flowering: January-December.